Elasmobranchs are interesting both from a scientific perspective and because of the characteristics their biology poses for their management. They may be associated with other major fisheries and often fail to get the attention they deserve. This publication is a contribution to reducing the oversight that is so often the misfortune of this group. We hope that the overview and detailed regional descriptions will help both the worker at the regional level as well as those involved in overall syntheses. 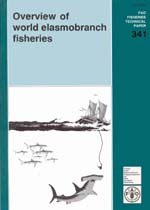 Access to otherwise unobtainable published and unpublished data and information on the particular elasmobranch fisheries of their countries/regions is gratefully acknowledged to the following persons: Mr. Leonardo Castillo, Instituto Nacional de la Pesca, Mexico City, Mexico; Dr. Che - Tsung Chen, National Taiwan Ocean University; Dr. Pauline Dayaratne, National Aquatic Resources Agency, Colombo, Sri Lanka; Mr. Shigeto Hase, North Pacific Anadromous Fish Commission, Vancouver, Canada; Dr. David Holts, National Marine Fisheries Service, La Jolla, USA; Dr. Rosangela Lessa, Universidade Federal Rural do Pernanbuco, Recife, Brazil; Mr. Julio Morón, Indo - Pacific Tuna Development and Management Programme, Colombo, Sri Lanka; Dr. Ramón Muñoz - Chápuli, University of Málaga, Spain; Dr. Sigmund Myklevoll, Institute of Marine Research, Bergen, Norway; Mr. Larry J. Paul, MAF Fisheries, Wellington, N.Z. ; Ms. Chee Phaik Ean, Fisheries Research Institute at Penang, Malaysia; Dr. Andrew Richards, Mr. Paul Tauriki and Mr. Paul V. Nichols, Forum Fisheries Agency, Honiara, Solomon Islands; Mr. Pairoj Saikliang, Depart of Fisheries, Bangkok, Thailand; Dr. Carolus M. Vooren, Universidade do Rio Grande, Brazil; Ms. Pouchamarn Wongsawang, Southeast Asian Fisheries Development Center Samutprakarn, Thailand. Dr. Timothy A. Lawson, South Pacific Commission, Noumea, New Caledonia, kindly contributed maps for some figures. Dr. Tony Pitcher gave useful ideas on early drafts of this document. Dr. David Die, FAO Rome, provided helpful comments to this document as well as valuable data. Dr. Kent Carpenter and Dr. Richard Grainger, FAO, Rome provided helpful technical assistance and gave access to the FAO fisheries statistical database. Ms. Alida Bundy kindly gave useful comments to the final version of the text. My final thanks go to Mrs. Ratana Chuenpagdee for all her assistance in the collection of data, preparation of figures and tables and final editing and typing of the review.